However, it became clear as I read through her review that she’d also see the political theme that underlay the adventure. INSURRECTIO channels the rise of fascism in our Europe in the 1930s. I write my books to entertain, but always with a more serious theme which readers may take or not. INSURRECTIO was an emotionally draining book to write as it dealt with a very dark episode in the Roma Nova’s history, and the younger Aurelia Mitela’s (sometimes ambivalent) part in it. It wasn’t intentionally written to reflect the rise of populism today, the impact of demagoguery and alternative facts, but if I’ve sparked some thoughts about these subjects, then I am content. 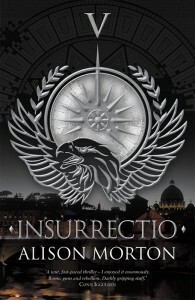 “Insurrectio by Alison Morton is the middle book of a prequel trilogy in the alternate history Roma Nova series which deal with an ancient Roman colony that survived as an independent nation in modern times. It’s of particular interest to me that Roma Nova is a matriarchy, and that the books are neither utopias nor dystopias. They attempt to portray this society realistically with all its strengths and weaknesses. This is why I have been reviewing books in the Roma Nova series on this blog. Here are the links to my reviews of books focusing on the 21st century protagonist Carina Mitela Inceptio, Carina and Perfiditas. I have also reviewed the first book in a 20th century trilogy about Carina’s grandmother Aurelia here. Insurrectio is the sequel to Aurelia. I was gifted with a copy of Insurrectio by the author via Book Funnel in return for this honest review. Those who have read the Carina books have seen references to the events of this novel. So I pretty much knew what would happen in a general way. Readers will wonder how a prequel in a thriller series can be suspenseful. Believe me, nothing in the Carina books can prepare you for Insurrectio. This was a true catastrophe for Roma Nova as a society and for Aurelia as an individual. I realized that the endangerment to the matriarchy in Perfiditas was less severe precisely because of the calamity that had occurred in the 20th century. Relatively few people were willing to allow Roma Nova to go there again. For women like Aurelia, having lived through Insurrectio must have functioned like an inoculation against a deadly plague. It stiffened their resolve in Perfiditas because they were very aware of the potential consequences. There was no World War II in Alison Morton’s alternate timeline but the vicious ideology of fascism was nevertheless percolating through the continent of Europe. As we see in our 21st century, fascism can emerge and spill across borders in any time of crisis. Insurrectio can be viewed as a timely warning to the complacent that it can indeed happen in your country. For those of us who are currently experiencing an outbreak of fascism, the intensity of the narrative may be magnified. In this novel Aurelia’s courage and fitness to lead are questioned. Since those who judged Aurelia hadn’t been through any similar ordeal, none of them could know how they themselves would react in those circumstances. In my view, Aurelia did what she felt she needed to do in order to protect the Mitela clan. I considered the situation traumatic, and was impressed that Aurelia managed to come through it and recover from the associated PTSD.